In 1775 the four New England colonies had raised their own armies in the aftermath of Lexington, and New York followed suit with encouragement from the Continental Congress. Lack of centralized direction allowed each colony to base its regimental organization on its own particular experience in the earlier Imperial Wars. Congress accepted responsibility for the troops in June when it established the Continental Army. The enlistments of most of the soldiers composing the field armies besieging the British strongholds of Boston and Quebec expired on the last day of December. Congress, George Washington, and his senior officers used the reenlistment of those troops as a vehicle for transforming the Continental Army into a unified national force. In the process they emphasized lessons derived from the French and Indian War. Washington’s Unified ReorganizationIn his first week at Boston in 1775 George Washington had identified several organizational problems, and his earliest letters to Congress suggested solutions. During the summer individual delegates visited the Main Army, and in the fall a special congressional committee held extensive discussions with the military leaders and with representatives of the New England governments. Based on that committee’s report and Washington’s recommendations, a number of major reforms were introduced for 1776. 2. Ibid., pp. 320-31, 390-400, 433, 450-54, 456-57, 505-13. On 10 July, the date Washington submitted his first report to Congress, he began a policy of sending personal letters to individual members of Congress. He used these letters to express opinions which would have been impolitic in official dispatches and to solicit the recipients to act as his agents in securing legislation he desired. 3. JCC, 3:265-67, 270-72; Smith, Letters of Delegates, 2:26-27, 64-65, 79-86, 112-13. For a general discussion of Congress’ role in the 1776 reorganization, see the following: Burnett, The Continental Congress, pp. 101-8; Donald John Proctor, “From Insurrection to Independence: The Continental Congress and the Military Launching of the American Revolution” (Ph.D. diss., University of Southern California, 1965), pp. 141-43, 151-83. 4. Fitzpatrick, Writings, 4:7-13; Force, American Archives, 4th ser., 3:1039-44. Other topics discussed included pay, rations, terms of enlistment, regulations, and enlistment of Negroes. On 4 November Congress approved the reorganization of the infantry into 26 regiments, each with the structure recommended by the generals. 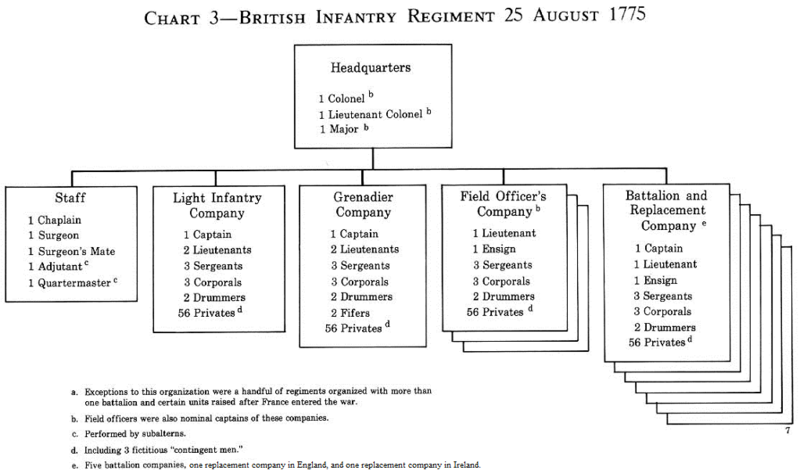 (Chart 2) It also accepted their plan for implementing the reorganization.6 Congress ordered that uniforms were to include brown coats with different colored facings (collar, lapels, cuffs, and inside lining of the coattails) to distinguish the regiments, a system borrowed from the red-coated British Army. Each regiment contained 3 field officers (who could not be generals or captains), a small staff, and 8 companies. Each company had 4 officers and 2 musicians, plus 8 noncommissioned officers and 76 privates evenly divided into 4 squads.7 At full strength the regiment deployed 640 privates and corporals—the soldiers who stood in the ranks with muskets—or 88 percent of its total of 728. The 32 officers and 32 sergeants provided a favorable ratio of one supervisor to ten rank and file for maintaining company-level control. 5. Force, American Archives, 4th ser., 1155-67; Smith. Letters of Delegates, 2:233-38 243-44. 298 337-38; Fitzpatrick, Writings, 4:22-23, 45-47, JCC, 3:313-14, 318. 6. JCC, 3:321-25, 399. Compared to the regimental structure established in October for units from Pennsylvania and New Jersey, the new structure added a lieutenant, a lifer, a drummer, and eight privates to each company: ibid., pp. 285-86, 291. 8. Headquarters Papers of the British Army in America, Colonial Williamsburg Foundation, nos. 27-29 (Sec at War Barrington to Gage, 31 Aug 75, with enclosure); 206 (Barrington, Circular to Colonels, 26 Aug 75); 288 (Barrington to Howe, 10 Jun and 18 Oct 76); 660 (See of State Germain to Howe, 1 Sep 77): 3181-82 (Sec at War Jenkinson to Clinton, 5 Dec 80); 3343 (Clinton, General Orders, 26 Oct 80); Edward E. Curtis, Organization of the British Army in the American Revolution (New Haven: Yale University Press, 1926), pp. 1-4, 23-24; Eric Robson, “The Raising of a Regiment in the War of American Independence,” Journal of the Society for Army Historical Research 27 (1949):107-15. 49were also captains. The grenadier company had two additional fifers, slots used for the regimental fife and drum majors. Three of the privates in every company were “contingent men,” fictitious names carried on the regiment’s rolls. Their pay was used as a special regimental fund for the care of widows and orphans. These exceptions plus normal detachments and details greatly reduced the fighting strength of the regiment. A British lieutenant colonel could deploy a maximum of only 514 men, 63 percent of the theoretical total; only 448 were musketmen. Such full-strength figures, moreover, were rarely seen during the Revolution. The differences in British and American regimental organizations reflected deliberate doctrinal differences. Britain, influenced by Frederick the Great and its own experience in the Seven Years’ War, produced a regiment tailored to formal European battle. It deployed its battalion companies in three ranks to achieve the density needed for a bayonet charge.11 The Continentals turned instead to their colonial tradition of aimed fire and to the lessons of the French and Indian War for inspiration. They adopted a formation using only two ranks, with a frontage more than twice the size of that of a British battalion (320 men to 150). In the American volley all 640 shots counted. The fire of a third rank was so ineffective that a British volley only hoped for 300 shots. 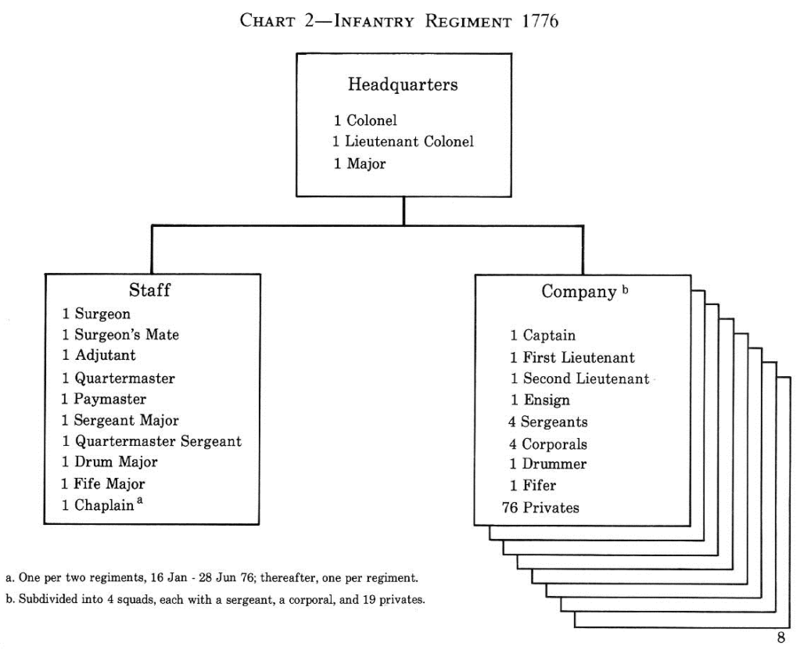 The regimental staff expanded during 1776. Original plans assumed that it would consist of a chaplain, a surgeon, and a surgeon’s mate, with the functions of adjutant and quartermaster being additional duties for subalterns. Congress formally approved the surgeon’s position on 8 December 1775 and the mate’s on 30 March 1776. The hospital staff screened all candidates since Washington considered it “a matter of too much importance, to intrust the Wounds and Lives of Officers, and Soldiers, to unskilled Surgeons.”12 At Washington’s request Congress added five specialists on 16 July. 9. British Headquarters Papers, nos. 371 (Germain to Howe, 14 Jan 77); 411 (Barrington to Howe, 24 Feb 77); 552 (Howe to Barrington, 1 Jun 77). 10. Ibid., nos. 496, 530, 660 (Germain to Howe, 19 Apr. 18 May, and 3 Sep 77); 1031 (Germain to Clinton, 21 Mar 78); 2993, 3181 (Jenkinson to Clinton, 5 Sep 80 and 5 Dec 81). 11. Ibid., no. 1999 (Clinton to Germain, 14 May 79); Glover, Peninsular Preparation; pp. 112-22; J. F. C. Fuller, British Light Infantry in the Eighteenth Century (London: Hutchinson & Co., 1925), pp. 79-92 124-57, 193; Sir William Howe, General Sir William Howe’s Orderly Book at Charlestown, Boston, and Halifax. 17 June 1775, to 26 May 1776, ed. Benjamin Franklin Stevens (1890; reprint ed., Port Washing. ton, N.Y.: Kennikat Press, 1970), pp. 132, 145-46, 294. By 1778 the British shifted to two ranks to compensate for endemic shortages and a lack of firepower: William B. Willcox, ed., The American Rebellion: Sir Henry Clinton’s Narrative of His Campaigns. 1775-1782 With an Appendix of Original Documents (New Haven: Yale University Press, 1954), p. 95n.